A while back I won Nigella Express from Serious Eats. Exciting, I know! It's the second book I've won from them. Maybe I should start playing the lottery? Nah. I don't do well with gambling. I'll stick to food blog giveaways. Anyway, I really like the book. I was worried it would be more in the "Retch-el Ray 30 minute meals" direction, and while there are some questionable shortcuts in some of the recipes, most of the food is just plain simple and delicious-looking. Re-affirms my girl-crush on Nigella. 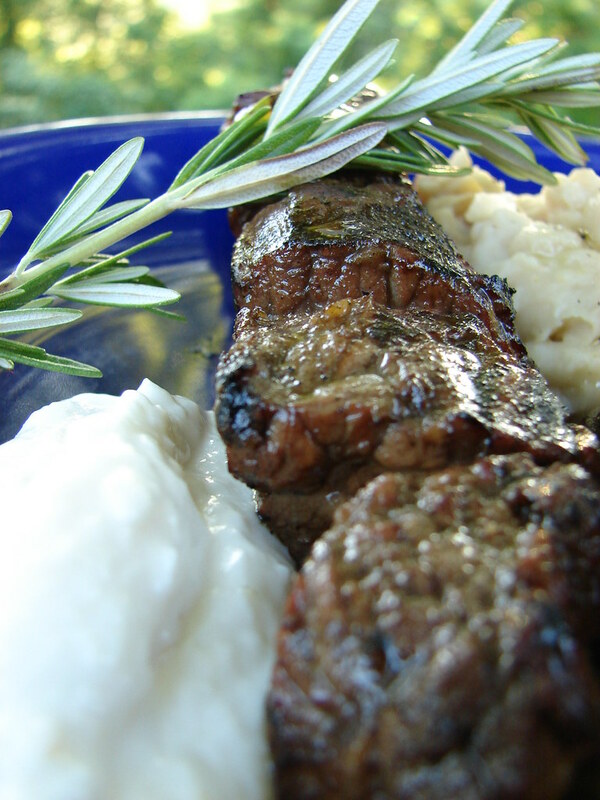 I tried out a couple of the recipes over the weekend - The Juicy Beef Skewers with Horseradish Dip and the White Bean Mash. Both were good! I will probably be doing this with beans again. I love beans, and this is an easy and different side dish idea. The skewers had good flavor, and were mostly juicy and tender. Some pieces were a little tough, but this may be attributed to my poor butchering skillz, or just the cut of meat itself, Rump roast, which is pretty darn lean. Cut beef into one inch cubes, and put into a freezer bag with olive oil, 1 Tablespoon horseradish, rosemary, vinegar, worstershire and port. Set aside for ar least 20 minutes, but preferably overnight in the fridge. Let the meat come to room temp, and soak bamboo skewers at the same time. Make the dip by beating together the sour cream and remaining 2 Tbsp. horseradish with the mustard and salt. Thread three or four pieces of beef onto each skewer and grill about 2 minutes per side. Heat olive oil with lemon zest and garlic through. Drain and rinse beans, add to be pan, warming through, stirring and squishing with a wooden spoon. Add the rosemary whole to flavor, and discard when ready to serve. Season with salt and pepper and drizzle with more olive oil. For a veggie, I roasted some fresh brussels sprouts with olive oil, salt & pepper. As you can see I REALLY roasted those mo-fos. Mmmm...they are so good that way. i love my b-sprouts like that...crispy! I'm also a fan of Nigella and this looks like another winner of a recipe. It's about time for me to to pull her summer cooking book out. I have the book and LOVE it (actually, I have all her books, the UK editions). I've made the white bean mash on several occasions and it never ceased to be good! 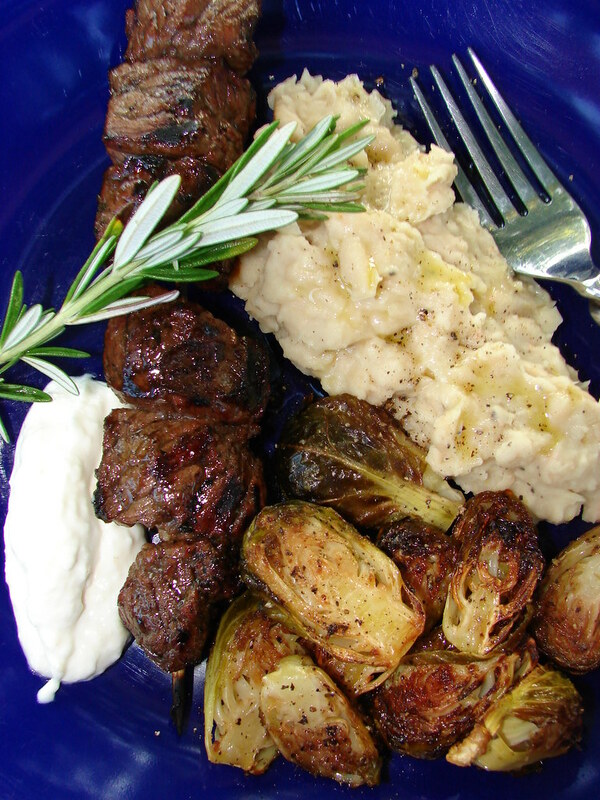 I am just going to have to try it with the beef skewers!